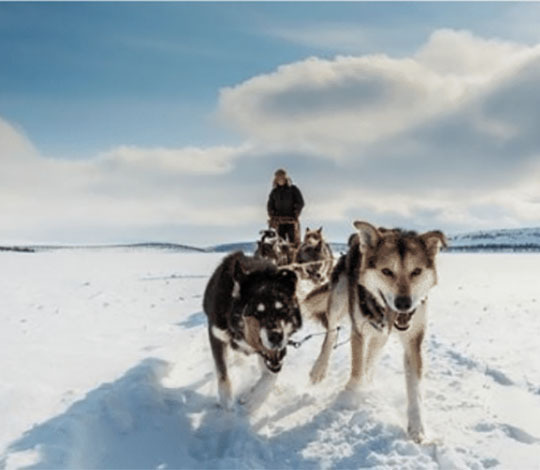 Dogsledding is popular and important in the Alta area, as the city is the host, starting and ending point for Finnmarksløpet, the world's second-longest dogsled race. Different kennels will give you their stories and show you were they are training and preparing their dogs for the race. 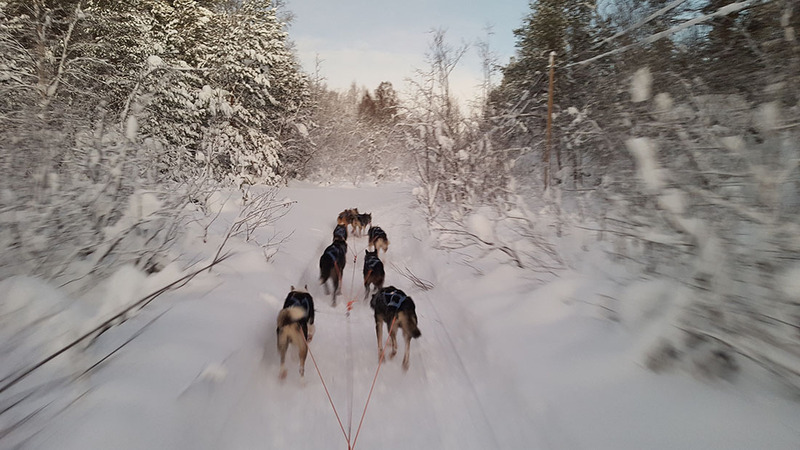 Going on this full day adventure with Holmen Husky Lodge you will experience both dog sledding and Sorrisniva Igloo Hotel. The tour starts from Alta city centre at 10:00 am and take you straight out into the Arctic wilderness. Our lodge is situated just outside the city centre, the starting point of the trip. Here we will supply you with proper winter clothing, to match the winter weather and you will meet your guide and the dog team. Your ride will take you into the forest outside of Alta and along the bank of the frozen Alta River known for its excellent salmon fishing in the summer. The adventure gives you the time to see the nature and wildlife surroundings. Stories from the guide combined with the feeling of running your own dog team, gives you the real idea about the culture among mushers and their dogs. If you're lucky, you might even catch sight of a moose or other wildlife along the way! When you return to the farm, you will head indoors to our Lavvo (a traditional Sami tent) where you'll warm up around a fire with a hot drink. One of our crew will answer questions and talk about racing dogs and life on the husky farm. And of course, there will be some extra time to visit and take pictures of your new four-legged friends, before we hop into the car and drive towards Sorrisniva. Sorrisniva will welcome you with a warm lunch based on local ingredients. After the meal, you will have time to explore the Igloo hotel, it`s art work as well as having a refreshing ice drink in the ice bar. After lunch and the visit, you will head back to either our Holmen lodge or the city centre. 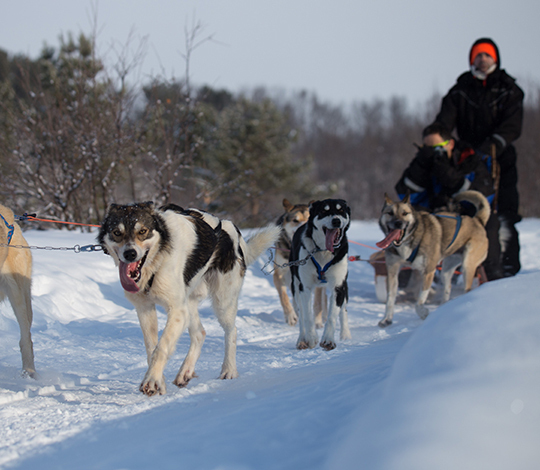 Take a ride and discover the fun and excitement of traveling by dog power with Holmen Husky Lodge. Holmen Husky Lodge is located about 15 minutes from Sorrisniva and a short distance from the Alta city center. After proper instruction for handling the sled you will head out together in pairs on the sled, one to drive and one to sit (with a switch at the halfway point). They will guide you into the forest outside of Alta and along the bank of the frozen Alta River. When you return to the farm, you will head indoors to a Lavvo (a traditional Sami tent) where you'll warm up around a fire with a hot drink. One from their crew will answer questions and talk about racing dogs and life on the husky farm. And of course, there will be some extra time to visit and take pictures of your new four-legged friends, before returning to Alta again. Guests drive in pairs, 2 per sled. NOK 1450,- per adult; 750,- per child under 12 years. Drive in the forest, the open landscape, and beside or on the Alta River. Next to Alta River, approximately 5 minutes from Sorrisniva Trasti & Trine’s kennel is located. There is a dog farm where guests can get to know the special mushing community. You will be given a list of the names of the dogs that will be in your dog team, and then it’s time to get started. With help assistant from the guide if needed you will get the dogs ready on your own. During the trip, you will drive in the forest, open landscape and beside Alta River or on frozen sections. 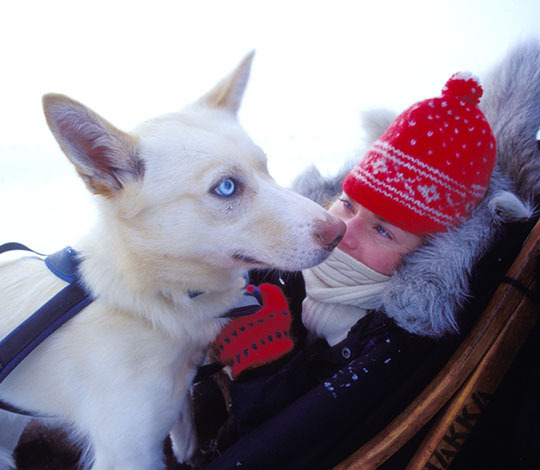 Two people ride per sled; one musher and one who sits on the sled. You stop and swap places en route. When coming back to the kennel, you will be served hot beverage and the guide will gladly share histories from the race. Transfer to/from downtown Alta, warm clothing, shoes, coffee/ tea and homemade cake.